The most important component of the setup is the cameras, so I picked the cameras I wanted first, then built up the rest of the rig around them. I decided to go with two Flir Blackfly S Mono USB3 vision cameras; I went with these cameras because they offer a good overall balance between image quality, resolution, price, and they use Flir’s Spinnaker SDK. They were also the newest cameras released by Flir at the time and it always feels good to be on the cutting edge. 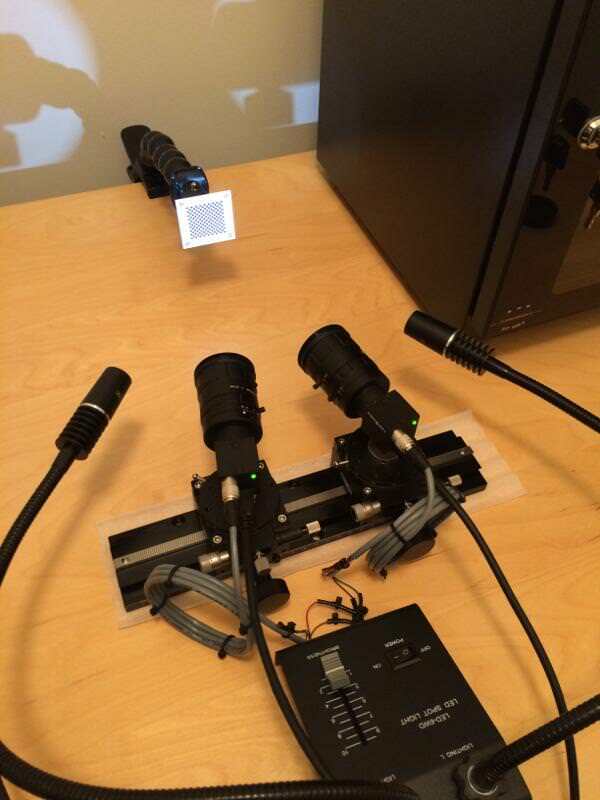 These cameras use a primary/secondary setup for synchronized capture. One camera (in my case, the left camera) is set as the “primary”. This camera will acquire the image and uses a “trigger” to send a signal to the other camera to acquire an image at the same time. Software trigger – Basically, the program handles the synchronization by sending a signal to the secondary camera via USB; a direct physical connection between both cameras is not required. 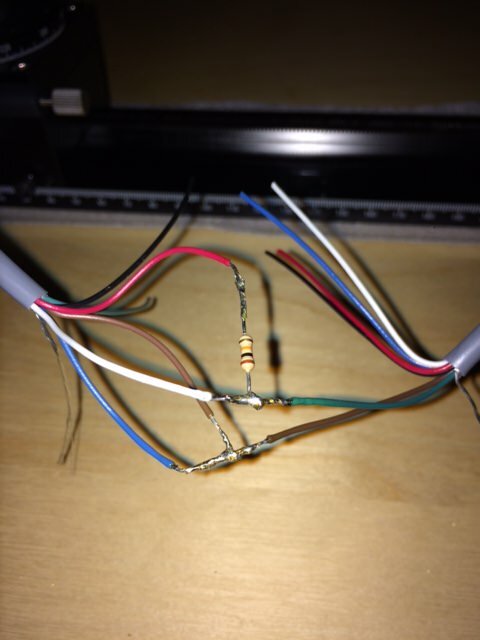 Hardware trigger – This requires a direct physical connection between both cameras via GPIO cable (The Blackfly S specifically needs a 6-pin GPIO cable). 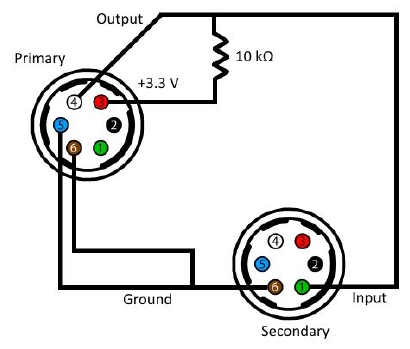 The primary camera sends a strobe directly to the secondary camera via GPIO at the beginning of the image acquisition, which triggers the secondary camera to acquire an image. This will allow for synchronized capture via hardware trigger, although both cameras will still need to be set up via the Spinnaker API (I’ll go over this in the next article). However, the lens I was looking at came in either 12 mm or 16 mm focal lengths. 12 mm results in a slightly larger FOV which I’m ok with, so I went with the 12 mm lens. Furthermore, the lens itself actually has adjustable focus, so that gives additional wiggle room. The next thing to consider is the depth of field. Since stereo cameras will need to acquire images with depth information, the lens should have a large depth of field (i.e. objects with a varying range of distances should be in focus at the same time). Smaller apertures result in a larger depth of field. This lens actually has an adjustable aperture; the aperture is typically adjustable in increments called “f-stops”, with larger “f-numbers” corresponding to smaller apertures. I’ve gone ahead and set this lens to a large f-number, although it’s important to realize that smaller apertures mean less light will hit the sensor. So, to compensate you will either need to increase the exposure (not ideal, since any movement during acquisition will be acquired during the exposure window, and may result in a blurry image), increase the gain (again, not ideal, as it increases noise), or increase the lighting (most ideal, but requires a light source). It’s also important to check the maximum sensor format supported (this lens has a max of 1.1″) and the mount type (this lens is a C-Mount). Both of these requirements are met by this lens and the Blackfly S.
The most important requirement for the rig is it must be sturdy; if it isn’t, then there might be relative movement between the cameras which would ruin the calibration. In my case, I’d also like the relative camera positions to be adjustable. The rack and pinion allows the baseline to be adjusted while the rotary stages allow the relative angles to be adjusted to modify the working distance. Most everything on this list is machined metal with relatively high tolerances, so rig is very sturdy, yet adjustable. The next step is to configure the cameras for synchronized capture via the Spinnaker API. This is discussed in the next article. Previous Previous post: bedpostx with Docker and Singularity! bedpostx with Docker and Singularity! DWMRI Preprocessing (and Quality Assurance) with Docker and Singularity!